Back in 2006, when Fab 5 was but a twinkle in the eye, Toshiba and SanDisk reportedly were considering locating Fab 5 in the Iwate Prefecture in northeastern Japan. Toshiba already had production facilities in Kitakami City, so this was likely the site under consideration. At the end of the day, the decision was made to build Fab 5 in southern Japan, in Yokkaichi, adjacent to the existing fabs. I shudder to think of the implications, if the decision had gone the other way. Kitakami is only 89 miles from devastated city of Sendai and the Fukushima Nuclear Plant. Sendai itself is only 80 miles west from the epicenter of last month’s massive Japanese earthquake. If Toshiba and SanDisk had decided to build in Kitakami, today’s worries would likely run the gamut from building and equipment damage, through rolling power outages to potential radiation risks. As it worked out, Toshiba and SanDisk decided to build next to their existing NAND fabs in Yokkaichi, about 500 miles south of Kitakami. We’ll know soon enough how the last quarter went at Yokkaichi. While there could be some issues obtaining raw wafers, my guess is the Yokkaichi fab complex will be able to patch together sufficient supply. Since Yokkaichi is in southern Japan, power supplies should be OK. There is likely minimal risk of rolling blackouts. Electrical power from the south can’t be sent north because the southern half of Japan uses 100 volt, 60 hertz, while the north uses 100 volt, 50 hertz (cycles per second) electricity. In the graphic above, Yokkaichi is on the first bay south of Tokyo in the 60 hertz zone. While no one is talking publicly about Fab 6 yet, one would hope that recent events have shaken up the status quo. In 2008, Toshiba announced its plan to build Fab 6 in Kitakami City, whether SanDisk was on board or not. Reading between the lines, SanDisk was having second thoughts. Fab 6 is coming, on way or another. Fab 5 will likely reach full utilization in 2014/2015. NAND demand driven by mobile, tablets, laptops and the enterprise will likely be overwhelming. Those such as SanDisk/Toshiba riding this wave with the expertise and IP to lean into the trend, will have to build or be left behind. Working backwards, I’m guessing we’ll get the Fab 6 announcement round about 2013. Initial planning is likely underway already. There are lots of angles which could contribute to decision making. The biggest would be progress on 3D R/W, the potential successor to NAND. All this said, I would hope that Toshiba realizes that Kitakami City is a risk not worth fighting for, as a location for Fab 6. Might be time to bite the bullet and look outside Japan to Southeast Asia. This entry was posted on Sunday, April 17th, 2011 at 5:29 pm and is filed under Uncategorized. You can follow any responses to this entry through the RSS 2.0 feed. You can leave a response, or trackback from your own site. Close call indeed. As I recall it, they were investigating building Fab 5 in Singapore before, and even had talked with the government about some tax incentives to go there. Yep, your memory serves you well. Back in 2005 rumors were that SanDisk/Toshiba were considering Singapore for Fab 5. As you note- the context was that Singapore was trying to attract foreign investments. As it turned out, Fab 5 landed in Yokkaichi- not Singapore, Taiwan or Iwate (Whew). FWIW my sense is that Toshiba was more interested in Japan than SNDK, but who knows. Whatever the case, earthquake risk was considered, and dismissed. I’m not so sure it will be for Fab 6. My guess is that SanDisk and Toshiba have probably been discussing Fab 6 for a while now. mid 2010: Shell construction begins. mid 2011: Phase 1 Shell scheduled for completion (Q2). mid 2013: Shell construction begins. mid 2014: Phase 1 Shell scheduled for completion. So what about Fab 6 location? Concerns about earthquakes, have shown to be justified. If Fab 6 is not located in Japan, then where? Singapore and China are both possibilities. China might be the natural location. Taiwan or the mainland- for lots of reasons. Thanks, Savo. 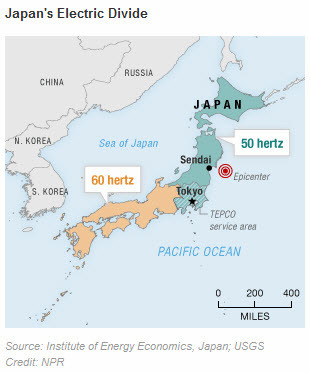 Very interesting that Japan is divided into 50Hz-vs-60Hz northern and southern kingdoms. Looks like Seasung represents a good strategic partnership between the two companies. Given Toshiba already has its own flash and HDD units, would SanDisk want to partner with Western Digital or just stay out of the hybrid drive market? Yep. I also noticed the Samsung/Seagate news and thought (again) of Western Digital as a potential partner for SanDisk. From a distance the fit looks good, and has for a while now. Probably a lot more at stake than hybrid drives per se. The Samsung/Seagate news also noted that the two would collaborate on development of enterprise storage systems and expand patent cross-licensing. Maybe a model there for SNDK/WDD. WDD needs a NAND partner for the enterprise. SanDisk seems to need something. Have you been following Fusion-io and Violin? Samsung has invested in Fusion-io and Toshiba in Violin. Lots of positioning going on. All this would make an interesting post. If you are interested, here is a short summary of the power grid story in Japan. A legacy from the 1800s. I haven’t been following Fusion-io or Violin Memory until you mentioned them. It’s kind of funny that on Violin Memory’s home page is a link to the WSJ article “Why Fusion-io’s IPO Could Melt Down” (http://blogs.wsj.com/venturecapital/2011/03/24/why-fusion-ios-ipo-could-melt-down/). Seems like these young companies are already at each other’s throats. It would be great to read your thoughts on how these two companies stack up (and what it means for the flash industry and SanDisk).